Dave Goebel has been a franchisor (president and CEO of Applebee's), a franchisee (Boston Market, Pie Five Pizza Co.), creator of several original concepts, board director (Jack in the Box Inc., QuickChek), an executive coach (Merryck & Co.), and philanthropist (Children's Mercy Hospital), but he's also learned how to identify when to invest in a brand. In his case, he has brought his family into the business and considers their input and research when making critical calls. He describes how his latest venture into the Pie Five concept came to be. 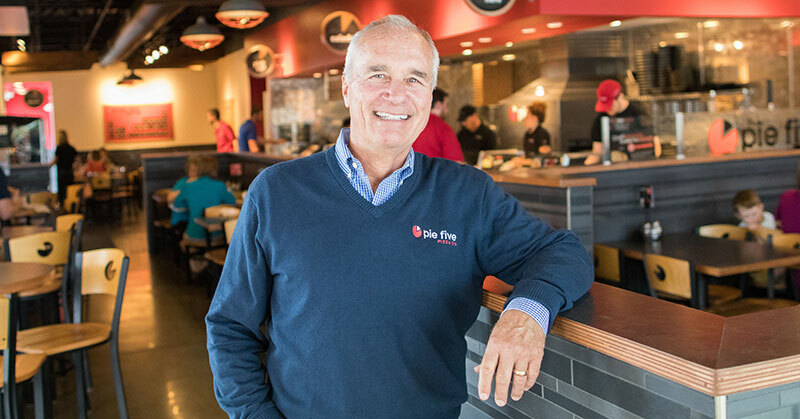 "Becoming a franchisee for Pie Five was actually the idea of two of my (triplet) sons, Kerry and Kevin. Kerry, whose brother calls him 'brainiac,' had done masterful spreadsheets and boiled our next venture down to fast casual pizza. (In all fairness, Kerry calls his brother "HR nightmare.")... The guys said, 'Dad, it keeps coming back to the fact that Americans are eating sandwiches, burgers and pizza, and that's probably not going to change.' So we went to Dallas and saw 142 pizzas coming out while employees engaged with customers on the line. It reminded me of the early days of Boston Market. We loved the concept because it gives us the ability to customize pizza for each guest's needs. They're all about consumer, R&D, food innovation, marketing - in other words, all about everything other than operations."